We look at various aspects of the heritage of human rights and community cohesion in North-east England. This includes the work of people like the Rev James Murray, the pamphleteer and activist Thomas Spence (right) and the artist Thomas Bewick. It also includes the huge crowds on Newcastle's Town Moor and how an aristocrat with a large monument in the region to his name helped Britain on the road to democracy - even if it was only a small step. The Anti-Slave Trade Movement in North-east England. Although there were some slave owners in the region, there were also many ordinary people who campaigned vigorously against the slave trade and slavery in the British Empire. They left a great legacy of internationalism in the region which continues to be built upon today. 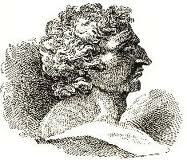 Joseph Cowen and Radical Newcastle. Newcastle M.P. 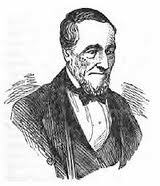 and newspaper owner Joseph Cowen was at the centre of much of the radical politics in the mid-late 19th century North-east. Working people continued their struggle for basic rights and the vote, international links were established with those struggling for freedom in Europe and Cowen also helped to lead campaigns for better housing and against the death penalty. 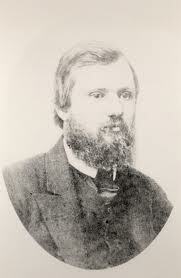 The trade unions and the Co-operative Movement. The mining unions in the region, whose origins can be traced at least as far back as 1765, were among the first trade unions in the country. By the end of the 19th century, North-east England was the most heavily unionised region of Britain. In the second half of the 19th century working people across North-east England also came together to deal with the problems of high food prices and the injustice of some of the miners being paid partly in tokens, which could only be used in the mineowners 'Tommy shops'. In the second half of the 19th century, the proportion of the population who were members of Co-operatives was higher in North-east England than anywhere else in Britain. Emily Davison and the Suffragettes. By 1900 many men in the country and in North-east England had the vote in parliamentary elections, but not a single woman. 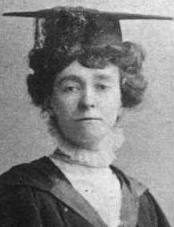 Emily Davison, from a Northumbrian family and buried in the graveyard of St Mary the Virgin Church in Morpeth, became the martyr for the Suffragette cause, when she died in hospital days after being knocked down at the Derby in June 1913. At the same time other women in the region also acted in inspirational ways tohelp pave the weay for women's enfranchisement in 1919 and 1928. The inter-war years were very hard times for many working people in North-east England as demand for the coal, iron and steel and dships they produced dried up, due to increased competition, worldwide economic recession and unsympathetic policies from central government. 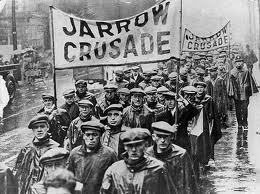 When unemployment in the Tyneside town of Jarrow passes the 50% mark in 1936, 200 men marched to London to ask for help for a steelworks to be set-up in the town and to be treated with dignity. They got a cup of tea and little and whilst it might seem they had achieved little or nothing, in the long rub they did much to change the way the British people saw themselves and each other. The 1930's also saw the rise of the anti-Semitic British Union of Fascists (BUF) under the leadership of Oswald Mosely, who sought to model the party on the Nazis in Germany. Moslet saw the North-east of England, with its high unemployment as a place where the BUF could do well, but most of the people of the region had other ideas. Instead they rejected the BUF, helped refuigees from the war-torn Basque Country, and when war came, it was a North-east regiment of the British army, which helped to liberate one of the most notorious of the death camps, while it was an eagle-eyed soldier. from Newcastle who spotted one of the most wanted of the enemy. In later years two prominent Afro-Americans would be given open-top bus processions through Tyneside, whilst Newcastle University became the only university in Britain to honour the most prominent member of the 1960's U.S. Civil Rights Movement in his lifetime. 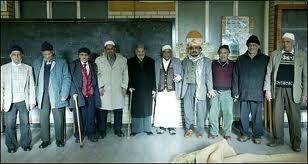 The proud record of community cohesion in the region. In the 19th century, as the coal industry expanded rapidly, the North-east came to resemble the Goldrush in the Yukon as people flooded into the region from as far away as Cornwall and Scotland. They all had to learn to live together and build cohesive communities throughout the region. One ;arge group who came was the Irish, who with their different faith and in many cases different language, were looked upon with suspicion, leading to a major riot by the banks of the Tyne. However in time the Irish would integrate well and become an integral part of the region. Similarly, when Arab boatmen in the early 20th century, followed in the footsteps of the Tigris Bargemen, who first settled near the mouth of the River Tyne in the early 4th century, there was again some hostility. However after an infamous riot in 1930, the Yemenis (right) became an accepted part of South Shields, to the extent that the town has been held up to the rest of the country as an example of good community relations. .